Although print and web design share a lot of the same principles, there are some important variations ranging from workflow and file formats to tools and terminology. The differences between print and web design can cause some confusion to people, which is why we have put this guide together to clear up a few of the differences between the two design disciplines. One of the biggest differences between print and web designs is how people view them, whether that is on a monitor, mobile phone or printed brochure. Holding something physical in your hand such as a piece of paper or a brochure is a much different experience than viewing something on a screen. Although there is some crossover with digital magazines, that are laid out similar to their printed counterparts. There is still a very clear dividing line between print and web design and the way designs are view play a big role in the decisions designers make. 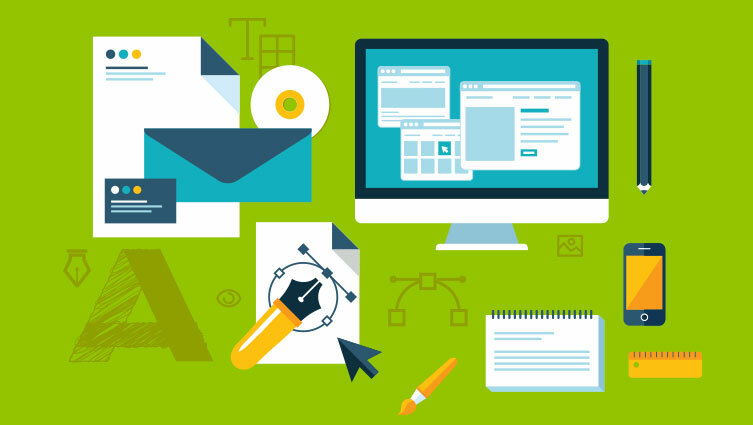 While print and web design have many design elements in common such as typography, shapes, images, lines, colours and copy, a designer will approach each slightly differently depending on whether they are designing for print or web. Take print for example, all of the information must be presented within the constraints of the printing surface, whereas with web designers have the flexibility to alter, arrange and filter information. Although with print designers are constrained by paper size, margins and bleeds, web design does not come without size constraints. When designing for the web it is imperative to ensure that your design displays consistently across multiple screen sizes, web browsers and devices. There are a number of different file formats for both print and web design, all these formats basically fall into two categories raster or vector. Raster images are composed of pixels, such as digital images, and can become distorted when enlarged beyond its original size. Vector images are not limited by pixels and can be scaled to any size. Some file formats can be used for both print and web such as JPEG, PDF, EPS and PNG, whereas TIFF files are for print only and GIF and SVG are web only formats. When it comes to typography for print design pretty much anything goes and the approach largely depends on the requirements of the project. Designers have complete control over how the typography looks when designing for print. But typography in web design is a completely different ball game, many designers will favour sans-serif fonts that are easy to read and display cleanly. Designers have less control of ensuring how fonts will display across multiple devices, browsers and platforms which is why readability and clean display are usually at the forefront of designer’s decisions.